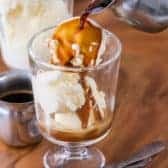 This classic Affogato Recipe features creamy vanilla ice cream topped with a shot of hot espresso. It’s a very simple 2 ingredient recipe that tastes rich and decadent! Simple to make and everyone absolutely loves it, we often spike this recipe with a splash of Frangelico or Irish Cream liquor! I am so excited to partner with Jura and their specialty coffee machines to show you how simple it is to create a delicious dessert. We love making affogato as an easy dessert after dinner. It’s a simple, fast, yet indulgent dessert that my husband and I can’t get enough of! 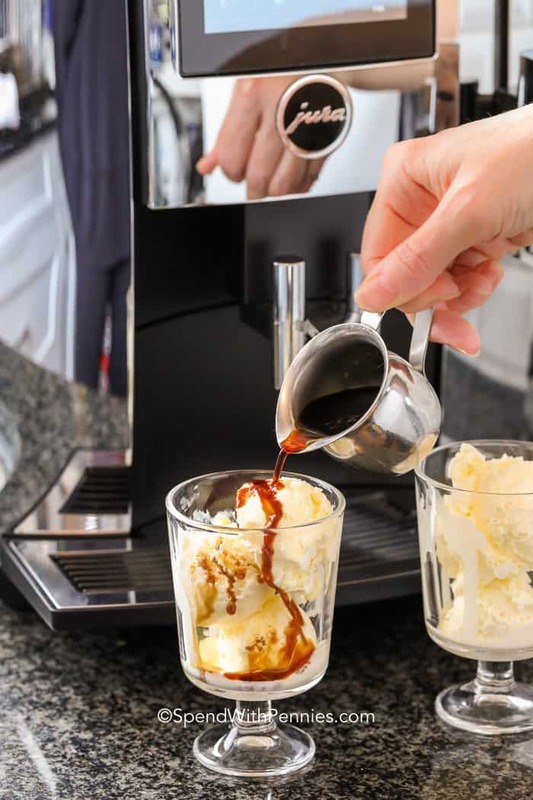 As long as there is ice cream in the freezer, we can use our Jura coffee maker and make a quick affogato in about 2 minutes. Affogato is the perfect Valentine’s Day dessert served after an amazing meal of Broiled Lobster Tail. It is romantic, fun, and full of sweet ice cream and bold espresso and one of those rare treats that is pretty much effortless! Affogato is an Italian dessert that refers to a scoop of gelato or ice cream that has a shot of hot espresso poured over it. When you’re at a coffee shop, ordering an affogato style coffee refers to the espresso being “poured over” the drink (added last) rather than the milk poured over the espresso. Since this recipe only needs two ingredients, you’ll want to ensure they’re the absolute best quality! Go for a good ice cream with flecks of real vanilla. Espresso provides most of the bold decadent flavor in this recipe and my Jura coffee machine makes the best ever at the touch of a button. It also creates all of our favorite coffee house drinks like lattes or americanos effortlessly. I have the Jura S8 Coffee Machine and not only is it gorgeous, I love how quickly it makes drinks and of course the the quality of the coffee drinks I can make at home is truly the best. This coffee maker is sleek with an easy to use touch screen and truly a prized possession in my kitchen! While you only need two ingredients to make an affogato (ice cream and a perfect shot of espresso), you can still get creative. Change up the classic combo from vanilla and espresso, with different flavors of ice cream. Hazelnut, chocolate, mint, and caramel ice cream are all delicious affogato style. It’s up to you! Make a boozy affogato by adding a 1/2 oz of liquor like Frangelico, Kahlua, or Bailey’s to the affogato. It’s super delicious! Scoop the vanilla ice cream into two serving cups. 4 Ingredient Red Velvet Cookies – easy peasy! 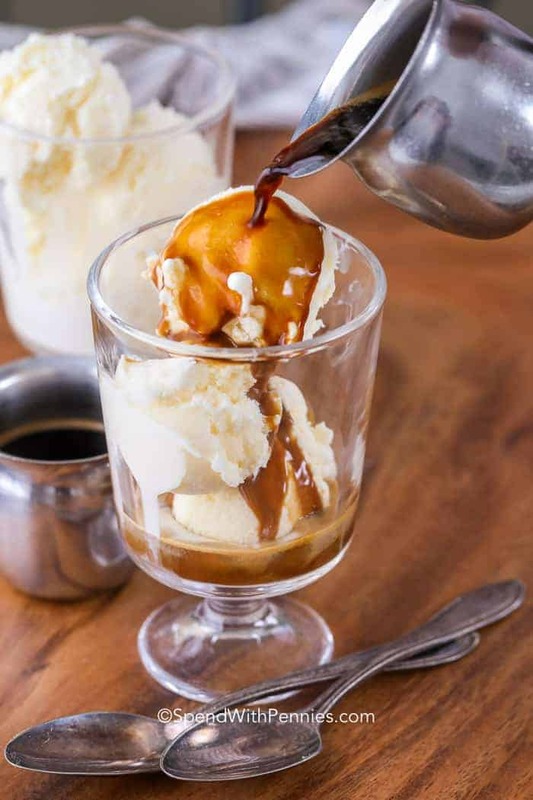 This affogato recipe features creamy vanilla ice cream topped with a delicious shot of espresso. An Italian classic dessert that is absolutely delicious! Make 4 shots of espresso using a Jura machine. Place a scoop of ice cream in each bowl. Pour espresso over ice cream. Add Bailey’s or Frangelico if using. 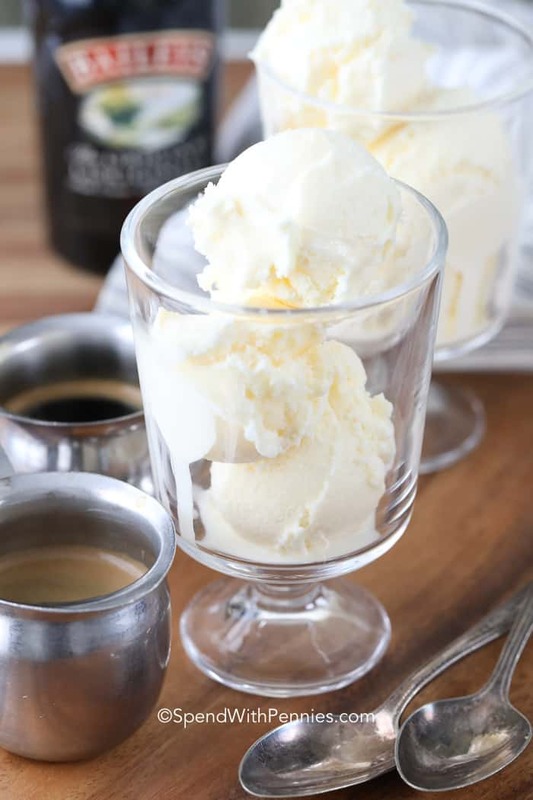 For a boozy affogato, add a shot of Irish cream, Kahlua, or Frangelico.